This time we are going to analyze how WeDoEssay.Com works. What is its place among writing companies and is it a good choice for those who feel the need for academic assistance? To find an adequate answer to this question, it is necessary to check the company in terms of the options it offers, the prices for them, quality guarantees and safety. We have also placed an order with this service and later we will tell you about our experience in detail. 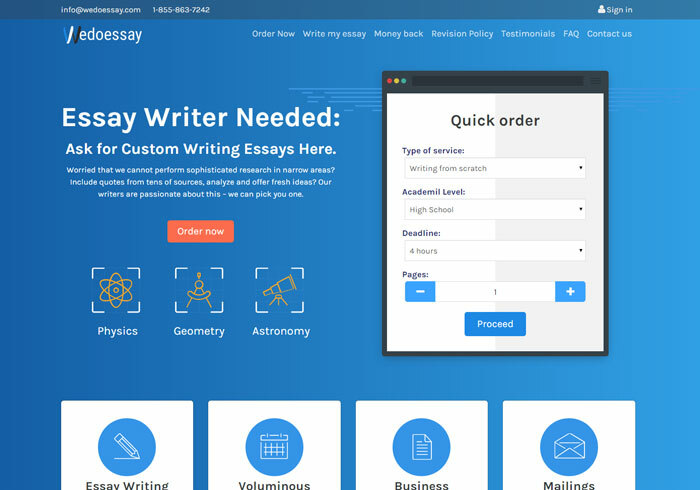 Having analyzed the order form and communicated with the support team, we have learned that WeDoEssay.Com can deal with a wide range of tasks. If you need a dissertation, a research article or any other project that requires research, you are welcome to select any of the extended deadlines (up to 14 days). In case you face a tough situation and you need a paper as soon as possible, this will not be a problem, as WeDoEssay.Com offers 4-hour deadlines. In some particular situations, you can even contact the support team and get your paper done within an hour or two. The list of subjects is subdivided into a few categories to make the navigation easier. It is quite long, but if you cannot find your subject in the list, you are offered to select “Other”. The support team assured us that selecting “Other” category will not have any influence on the quality of your order. One can find humanities as well as technical subjects in the available ones. Essays on engineering, IT projects, calculations on Accounting, etc. – everything can be done by the experts of WeDoEssay.Com. As for the projects, when it is hard to define the number of pages needed, it is possible to contact the support team, and they will guide you into how to place your order. You may need to get your paper written from scratch, or your own work amended. For the major changes, one can order the correction of 70% of their draft. If you need minor amendments, it is possible to pay for Editing – that is the correction of 30% of the text you have written yourself. There is also a good service for non-native speakers and those who have difficulties with grammar – that is proofreading. These extra services are much cheaper, but they will be very helpful for students who need a high-quality outcome. The prices offered by the company are quite low, starting from $9.90 per page. In addition to this, there are a lot of opportunities to lower it: the support team has guided us into that, mentioning regular discounts, holiday discounts, and ways to modify instructions to get a better price. A lot of services which have low prices experience difficulties with quality control. As we have found out, this company is not one of them. The writers hired have at least Master’s degree in various fields. There is a Quality Control department that checks every single paper before it is sent to the customer. Moreover, if a customer wants something to be bettered after they get their order, this is possible for free with the revision policy. Actually, you do not risk with WeDoEssay.Com, because you get your money back if you are not satisfied with what you get. The payment process is secure, and there is no possibility of the hidden charges since the company does not know your payment details. As we have mentioned earlier, we have tested the service to get the objective impression of it. We placed an order for an assignment in Math. It was a multiple-choice exam, so we contacted the support team in advance to discover how to place an order. At first, we placed an order for 1 page, and later we got a special link to proceed with the payment. We needed it to be done within 24 hours, and in around 20 hours we got our order completed. All 25 answers were correct, so we were completely satisfied with the help by WeDoEssay.Com. After the attentive analysis, we can assure our readers that WeDoEssay.Com is a good service to use, so we do recommend it.